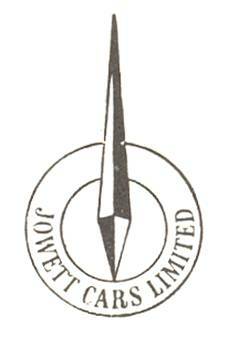 These special service instructions are issued by Jowett Cars Ltd. for the use of Javelin owners wishing to obtain maximum performance for competition work. Owners are reminded that any modifications made to a Javelin for the purpose of competition work, or participation in competitions, automatically invalidates the guarantee. 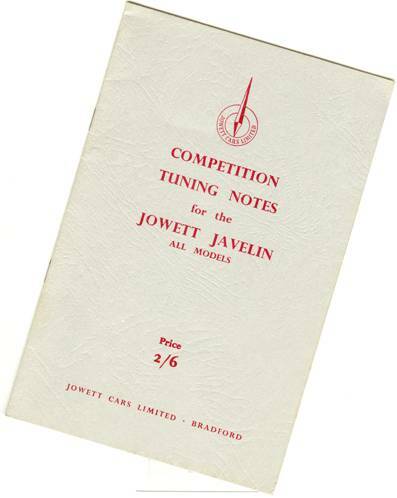 Because the ‘Competition Tuning Notes – For The Jowett Javelin’ were published in 1952, many more modifications were implemented after that date which make some of the information irrelevant or vague. Also, many of the parts mentioned were superseded or are no longer available, however in some cases parts from other vehicles may be modified to suit. Produced here are the ‘Notes’ and (in italic type) Neil Moore's comments and information. These instructions apply to the Javelin car and are intended as a guide to tuning for maximum performance. It is extremely important that these are read in conjunction with the Mainten­ance Manual for the Javelin, which describes in detail the work involved in stripping and assembling the units concerned. In addition, it is important that the standards of workmanship and cleanliness are of the highest order if success. is to be assured. Exhaust Ports – On Cylinder Heads fitted to early cars, the radius under the lower side of the Exhaust Valve Seating may be considerably increased. Metal has been removed here on later castings, increasing the cross section area at the throat of the Port (Fig. 1). Figure 1. Re-profiling exhaust ports. 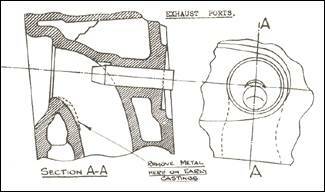 b) Inlet Ports – As with Exhaust Ports, early castings have more metal than is desirable under the Valve Seating. On later castings, metal has been left on the opposite wall, with improved results. This cannot be done on the early' castings, but the rough edge may be faired off to reduce the buffer effect under the shoulder (Fig. 2). a) NOTE: This porting and polishing procedure applies to PA and PB (Pre 1950) and PC (1950-51). The introduction of the PD engine (1952) brought a modifica­tion to the cylinder head casting with a vertical web running under the sloping part of the combustion chamber, giving extra strength when the head has been planed to correct capacities after porting and polishing. This web is visible through the lower water passage in the heads. In the PE Series III (1953) engines this whole procedure was carried out by the factory to these instructions. c) Combustion Chamber – All sharp edges should be removed. 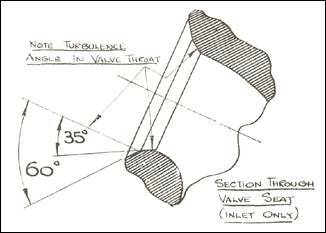 .The undercuts round each valve should be blended off to ensure a smooth gas flow and to assist turbulence (Fig. 3). Figure 3. Re-profiling combustion chambers. d) Alignment of ports with manifolds. 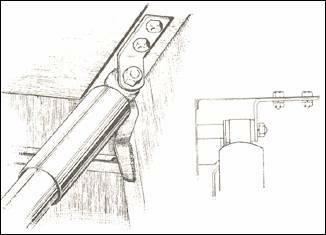 This is particularly important and can be checked by blueing the flange faces and then bolting up with paper between; by observing the pattern on each side of the paper, the points where metal is to be removed to make the ports coincide can be observed. e) Valves – The Valves and Seats must be in first-class condition, with no signs of pitting or excessive narrowness. 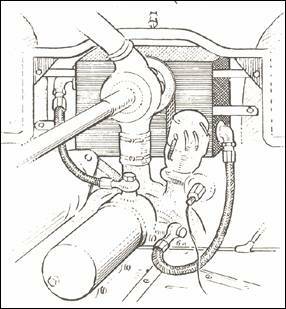 A seat width of 3/32” should be maintained for the Exhaust Valve and 1/16” for the Inlet Valve. It is important that the turbulence angle is maintained on the Valve Seats, as shown in Fig 4.
e) NOTE: Early Vauxhall Exhaust Valves of the same head diameter but of more robust dimensions may be used if the ends of the stems are shortened to approximately 1/16” above the collet groove and care taken that adequate clearance is main­tained at the top of the guide in relation to the valve head. It is recommended that valve seats requiring building up or cracks needing repair be done by welding –- preferably by the ‘Eutectic’ process, as this minimises distortion and the resultant weld deposit can be machined easily. f) Valve Springs – If it is desired to lift the Valve Bounce point of the Engine above 5,500 R.P.M. stronger Outer Springs should be fitted (our Part No. 52964). f) NOTE: Part No. 52964 is still available from L. J. Golding, Auckland. Figure 4. Section through valve seat. Remove the Cylinder Head and lay flat on a bench with the Combustion Chambers face up. Insert a set of spare Spark Plugs. Fill the Combustion Chamber with fluid, flush to the face. This capacity should be between 40 and 41 cc. (Fig. 5). Figure 5. Checking combustion chamber capacity. Piston Part No. 53227, 8.0 to 1. It is recommended that the higher Compression Ratios should not be used unless fuel of at least 80 Octane rating, or 25 per cent Benzole mixture is available. 7.2 to 1 = 58 c.c. 7.6 to I = 56 c.c. 8.0 to 1 = 53 c.c. Note: an error of plus or minus 2 per cent is allowable in the above volumes. Any corrections to the capacity can be made by machining the Cylinder Head Gasket Facing 0.011” (0.2794 mm) removed here reduces the capacity by 1 c.c. h) NOTE: Piston supply in New Zealand at present is nil. However the following pistons can be used – 75 mm and 77 mm Volkswagen pistons, giving approx. 8.8-9.0 to I; 74.9 mm Vanguard Six and Triumph 2000, giving 8.8-9.0 to 1; 74.3 mm Vauxhall Viva, giving 8.4 to 1. Triumph 1300 are also apparently suitable. However, these all require modification. and machining to some degree and ­it is suggested that advice from someone who has fitted same be solicited before undertaking this job. Negotiations are at present being made to ensure a future supply of Javelin pistons. Australian Note: Pistons to Jupiter specification are manufactured in Australia. Flat top pistons can be ordered (January 2007). Copper/asbestos/Steel Cylinder Head Gaskets are available (Golding), which are 0.010” thinner than copper/asbestos/copper gaskets but have a slightly larger combustion space capacity which can accommodate larger pistons. Petrol in U.K. when the original Notes were written was "pool" of 70 octane rating. i) Bearings – Engines up to No. E0/PB/8902 were fitted with White Metal Connecting Rod and Main Bearings, and an un-hardened Crankshaft. It is advisable to replace this assembly by an induction hardened Shaft to our Part No. 50647, which will necessitate the use of Copper Lead Bearings except for the Rear Main Bearings which remain in White Metal, the Part Numbers of these are Connecting Rod Assembly – J54444, Main (Front and Centre) Bearings – 52573, Rear Main Bearings – 50646. (standard sizes). It is vital when refitting Bearings that absolute cleanliness is assured and rag should in no circumstances be used to wipe components: they should be washed in clean petrol and blown off by air. Great attention should also be paid to the sealing of the Crankcase Balance Pipe Rubber Ring as detailed on Page 35 of the Maintenance Manual. i) NOTE: Numerous Bearing changes in numbers and minor details took place due to JCL chasing the bogey of bearing failure and broken crankshafts. The main cause showed itself to be starving of the main bearings. especially the Centre Main Bearing, and over supply of oil to the Big End Bearings. 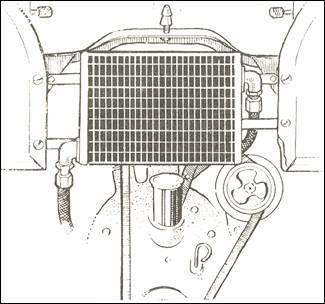 The partial answer to this problem was enlarging of oil-ways as in the Series III engine, and the fitting of an oil cooler which gave a fairly satisfactory life if the Series III grinding sizes were adhered to for crankshaft. 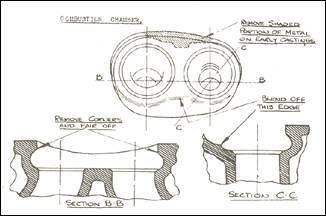 ‘Vandervell’ make Main Bearings for these specifications in copper-lead (Part No. 1959) with a White-­metal Rear Main (Part No. 1960). Particular attention must be made to retaining 0.100” radius fillets on regrinding crankshafts. Under no circumstances should White-metal Big End Shells or White-metal Front and Centre Main Bearings be used. Perkins ‘Alu-tin’ bearings can be used in Mains providing shaft tolerance is revised to 2.2500” - 2.2498” and the groove kept to a minimum (an article on this subject is being prepared). Alu-tin Bearings for Big End Shells from Humber 90 and Minx (Repco Part No. 4K2911 AL) can be used with shaft tolerance 1.9998” - 2.000”. These are slightly narrower than Jowett original, but are satisfactory. For more information about bearings, refer to PART V – CRANKSHAFT BEARINGS. Disregard the Jowett Part Numbers quoted in the original text! Early Crankshafts, i.e., Square Web solid and with 15/16” hole through Big Ends, should be crack tested before replacing. For high performance, an Oval Web Shaft should be fitted. (Approx. 30 new ones are available from Goldings!) 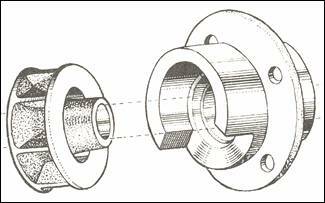 The Oval Web Crankshaft was not apparently fitted until after the factory stopped producing cars early in 1954, but as the Flat Crankshaft broke with monotonous regularity most have been replaced. After 1958 the Oval Web Crankshafts were Nitrided – the date of manufacture being stamped on the Front Web, e.g..3 over 62 being March 1962.
j) Clutch – It is desirable to replace the Clutch Friction Disc with one of a woven type having a greater coefficient of friction, this is available under our Part No. 52420/A. j) NOTE: This Clutch Plate 52420/A is the deluxe type available from most retailers. The Pressure Plate normal for Javelin is Borg and Beck B2 with Blue Springs – however a stronger Pressure Plate with White Springs can be obtained from Motor Traders Ltd. The reconditioned Pressure Plate Assemblies from some suppliers are not recommended as the balancing is very suspect. 27 mm Choke; 110 Main Jet; 50 Compensating; 2.2 Vent over Capacity; 45 Slow Running; 120 Progression; 1.5 mm Needle Seating (1 mm Washer) should be fitted in place of the Standard VM. 4 or 5. These Carburettors are interchangeable and carry our Part- numbers ­LH – 1.53732; RH – 1.53733. The Throttle Spindle operation is in the reverse direction, and the Throttle Cable must consequently be rearranged. A suggested method is to fit a Cable approximately 9”. (25 cm) longer than standard, securing the Inner Cable to the Bracket on the left hand Tappet Cover, and the Outer Cable to the Throttle Rod. The Throttle Return Spring should be connected to the Clip to which the original Outer Cable was secured on the right hand Tappet Cover. k) NOTE: This 30 VM Carburettor is available from Joseph Lucas, but 'the jets will have to be altered and pairs will not be available –- only one side. This will mean that the controls on one side will be on the outside; however controls from an old carburettor could be substituted. The main point to watch is the position of the hole for the Advance/Retard Fitting to the Distributor. Some carburettors use this fitting with a hole to the underside of the butterfly for a vacuum brake booster unit and if this is fitted to a Distributor will give full Advance on starting up. The hole should be on or slightly above the butterfly. l) Water Pump – On all Engines prior to PA.5857 the Water Pump should be modified to increase its capacity to 7 gallons/min. at 1,500 R.P.M. On Engines subsequent to the above number the modification was incorporated. The modification consists of a modified Cover and the addition of a Shroud Assembly to the Impellor, as shown in Fig. 6. In addition to the above the Thermostat should have the 2 Bleed Holes enlarged to 3/16” diameter if prior to the above number. l) NOTE: ‘Waxstat’ failsafe Thermostats are now available for the Javelin and are a more positive type of thermostat. As the Pump Bypass is through the 3/16” holes, these should be drilled in the valve plate. Figure 7. Left: Impellor shroud; Right: Later cover. m) Oil Pump – It is recommended that an Oil Pump of increased capacity be fitted to our Part No. AS.52403. Engines built subsequent to PA 800 have this modification incorporated. m) NOTE: The Oil Pump mentioned had a 3/8” OD 5/16” ID discharge pipe to block and fixed adjustment. From E1/PC/18985 a tailpipe was fitted to the Bottom Cover Relief Valve hole to direct discharging oil under the surface and stop aeration. From E2/PD/21937 and E2/SA/882 (Jupiter) September 1952 an increase in the Discharge Pipe to 7/16” ID and Internal Galleries of the Block was made. From E2/PE/23122 and E2/SC/945 (Jupiter) December 1952 a deeper pump was used with the same gears and a new Base Plate with Relief Valve returning internally to suction side of pump. The Relief Valve was fully adjustable and set at 65 - 70 psi. Refer to Part IX – OIL PUMP. NOTE: The oil pressure was raised to allow for extra resistance of oil cooler pipes to maintain adequate flow. n) Oil Cooler – It is recommended that the Rear Timing Case Cover Part No. 50690 and early type Oil Filter Assembly should be replaced by the latest type Assembly. Engines built subsequent to El/PC/16603 incorporate this latest type of new Rear Timing Case Cover to our Part No. 53030 and Tecalemit Oil Filter Assembly. The above allows an Oil Cooler, Part No. J54532 to be fitted as shown by use of two Flexible Pipes to Part No. J54519. n) NOTE: Disregard Oil Cooler Number –- not available. A VW Cooler can be used modified as per article by G. Fisk in ‘Flat Four’ 1966. Figure 8. Oil cooler installation from front. Figure 9. Oil cooler installation from rear. o) Fan – The Fan Blades should be stiffened by the addition of extra welding along the base of the Blade where it abuts on to the Centre Spider. This will necessitate re-balancing the Fan Assembly which can be done by mounting it on a suitable arbour and rolling on knife edges, metal being removed from the tips of the Blades in order to restore static balance. p) Ignition Setting – The recommended setting is with the points breaking at approximately ¼” (6.5 mm) ATDC (measured on the Flywheel Rim). This setting will cause the Engine to ‘pink’ on 1/3 to ½ Throttle at 20-30 M.P.H. (32-48 K.P.H.) when suction advance is operating. The ‘pink’ should disappear completely on Full Throttle. Layshaft (Cluster gear) – 52734 (33 teeth). 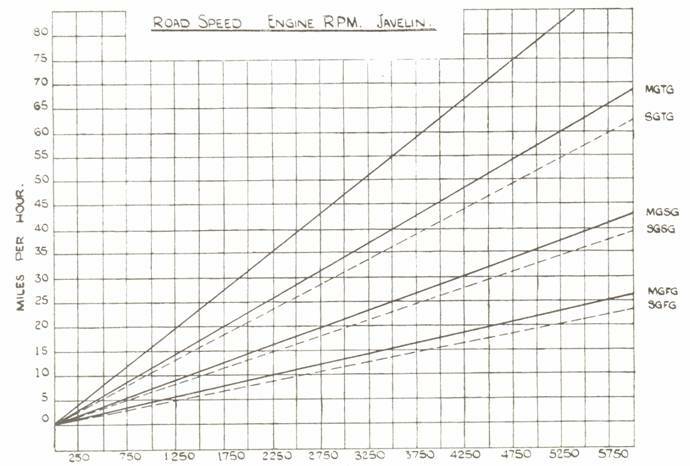 Note: Cars fitted with gearboxes numbered J1 upwards, on the gearbox top, Incorporate these ratios. NOTE: It is recommended that a large centre main shaft thrust washer be fitted. They were fitted to late model gearboxes. Propellor Shaft Universal Joint (50916). These Joints, particularly at the front should be carefully examined on all cars which have run more than 6,000 miles (9,000 km) and it any rubbers show signs of deterioration the Joint should be replaced. Care should be taken to specify whether the car has the early Hydraulic Front, Mechanical Rear operated system or the Full Hydraulic, when ordering. Rear Shock Absorber Upper Pin – A modification to stiffen up the Rear Shock Absorber Upper Pin was introduced at Car No. 17672. Check that this has been carried out and if not modify the Mounting of the. Pin in accordance with Fig. 7. Shock Absorbers – A 25 per cent stronger all round setting is recommended for most types of Competition work. As an alteration in the setting involves complete dismantling of the Shock Absorbers, replacement by the stronger type is advised: These carry our Part numbers Front 54385 (fitted as standard from Engine No. 16500), Rear 54675 (Competition). NOTE: From E2/PD/2188 and Jupiter E2/SA/865 the New Metalastic Rubberised Suspension was fitted. This is a superior suspension in all respects to the earlier type for competition work. The 25 per cent stronger type early Shock Absorbers are the only type available now. Figure 10. Arrangement of rear shock absorber mount. Batteries – It will be found advisable to protect these at the front and base with a sheet metal case for high speed motoring over loose surfaces. In addition to the special work described above, it is very necessary that the normal servicing of the car as detailed In the Instruction book and the Maintenance Manual, is carried out. Rolling Radius of Tyre 12.7in - Tyre Size 5.25 - 16. Valve Spring Surge occurs at 5,500 revs. per min. with Standard Valve Springs. Warning Note: First gear in ‘High Ratio’ gearbox is not as durable as it is in the standard gearbox.